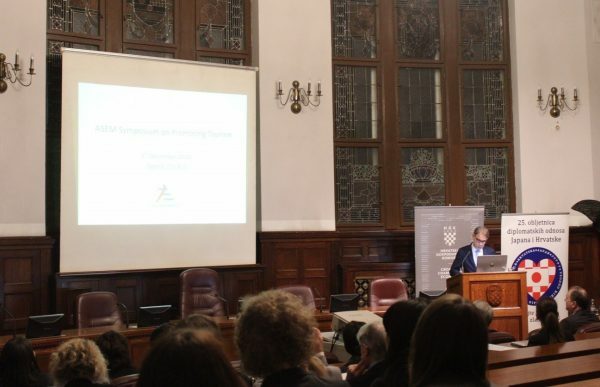 On December 3, Japan and Croatia held the “ASEM Symposium on Promoting Tourism in Zagreb” at the Croatian Chamber of Economy in Zagreb, Croatia. It was an event to celebrate the 25th anniversary of establishment of diplomatic relations between Japan and Croatia. The Symposium aimed to further deepen the discussion on promoting tourism as a way of strengthening connectivity between Asia and Europe and especially focused on Sustainable Tourism and Education for Tourism. At the beginning, H.E. Mr. Keiji TAKIGUCHI, Ambassador of Japan to Croatia, made a welcome speech, followed by H.E. Mr. Gari CAPPELLI, Minister of Tourism of Croatia and Mr. Mr. Ivan Barbarić, Vice President for International Affairs and EU, Croatian Chamber of Economy. They emphasized that this Symposium was a good opportunity to exchange lessons and they would like to take advantage of this occasion to promote the people-to-people connectivity not only between Japan and Croatia, but also Asiaand Europe. Sustainable Tourism was discussed in the first half of the Symposium. Ms. Reiko NAKAYAMA, Director General, Japan National Tourism Organization, Paris Office and Mr. Frano Matušić, State Secretary, Ministry of Tourism of Croatia explained sustainable tourism policy of each government respectively. In the second half of the Symposium, Education for Tourism was the main subject. Ms. Yumiko HORITA, Professor, Wakayama University, Faculty of Tourism and Mr. Alen Jerkunica, Dean, University College ASPIRA, focused on efforts and challenges of Education for Tourism. At the end of the Symposium, Mr. Hiroaki SANO, Director of the Asia-Europe Cooperation Division in the Ministry of Foreign Affairs of Japan, delivered a closing speech. He stated that Japan would like to deepen discussion on promoting tourism at the 14th ASEM Foreign Ministers’ Meeting based on the results of this symposium. Participants representing different institutions, namely, the Croatian Government, local business community, Japanese and Croatian tourism industry community, Japanese and Croatian universities, attended this meeting. Diplomatic delegations of the ASEM Partners in Zagreb also contributed to the discussion in the event.